Molecular signatures defined through a systems biology approach can predict responses to flu vaccines in the young and elderly. Photo: Immunologist Bali Pulendran, PhD (standing) discusses data on flu vaccine responses with a colleague. What factors inhibit strong responses to seasonal flu vaccines in the elderly? Why do anti-flu antibodies last longer after vaccination in some people? Answers are emerging from an Emory University-based systems biology analysis of blood samples from more than 400 volunteers who received seasonal flu vaccines. 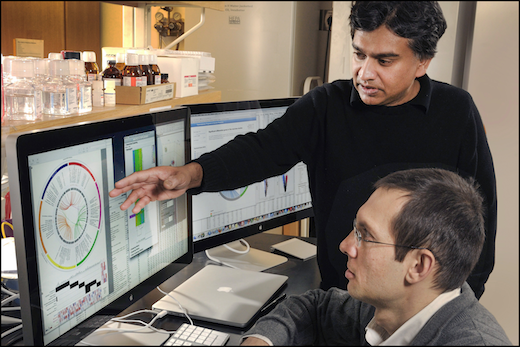 Bali Pulendran, PhD, led a team of researchers who tracked patterns of gene expression, known as molecular signatures, of strong immune responses in volunteers’ blood across five consecutive seasons from 2007 to 2011. The results were published online in Immunity on December 15. Pulendran, who is senior author of the Immunity paper, is Charles Howard Candler professor of pathology and laboratory medicine at Emory University School of Medicine and a researcher at Emory’s Yerkes National Primate Research Center. In previous work, Pulendran and his research collaborators were able to define molecular signatures in blood cells a few days after vaccination. These molecular signatures can predict the strength of the immune response weeks later. "Until this study, we didn’t know whether those signatures would be similar in diverse human populations or across multiple seasons," Pulendran says. "Our results indicate that certain conserved elements of such signatures are indeed similar in the young and elderly as well as across multiple seasons." The scientists also identified a distinct molecular signature in volunteers when their antibody levels stayed relatively high for several months after vaccination, which could guide efforts to design long-lasting vaccines. Pulendran’s laboratory teamed with systems biology expert Shankar Subramaniam, PhD, co-senior author, and colleagues at University of California, San Diego (UCSD), and analyzed samples from the Hope Clinic of the Emory Vaccine Center and also data from a previous study from Baylor University. Co-first authors of the paper are Helder Nakaya, PhD, now an assistant professor in the School of Pharmaceutical Science at University of São Paulo, and UCSD graduate student Thomas Hagan. Emory co-authors include Emory Vaccine Center director Rafi Ahmed, PhD, and two others from the Emory School of Medicine, assistant professor Nadine Rouphael, MD, and professor of medicine Mark Mulligan, MD. Additional co-authors include Eva Lee, PhD, at Georgia Institute of Technology in Atlanta, and Bonnie Blomberg, PhD, and Daniela Frasca, PhD, at the University of Miami. While the researchers found people older than 65 tended to have weaker antibody responses to vaccination, there were common elements of molecular signatures that predicted strong antibody responses in younger and older volunteers. However, elderly volunteers tended to have stronger signatures from immune cells that are not directly involved in producing antibodies (monocytes and ‘natural killer’ cells), both at baseline and after vaccination. This indicates a potential connection between the baseline state of the immune system in the elderly and reduced responsiveness to vaccination. In addition, a majority of volunteers, young and old, showed a significant drop in the levels of anti-flu antibodies within six months of vaccination. How much antibody levels decreased, however, varied from person to person. "Surprisingly, the signatures capable of predicting antibody responses at four weeks did not correlate with the longevity of antibody responses at six months or a year," Pulendran says. "Rather, a distinct signature was found to correlate with longevity." In the weeks following the peak of an immune response to a vaccine, most of the antibody-producing cells from the blood die, but some find a permanent home in the bone marrow. The longevity signature appears to be connected to this process, Pulendran says. "We are currently extending the results of this study to other vaccines to determine whether the signatures of influenza vaccination can be used to predict immune responses to other vaccines, and if, indeed, there is a universal biomarker of antibody responses to vaccination," he continues. The research was supported by the National Institute of Allergy and Infectious Diseases (U19AI090023, U19AI057266, U54AI057157, R37AI48638, HHSN272201400004C), the National Institute of Diabetes and Digestive and Kidney Diseases (R37DK057665), the National Science Foundation (STC-0939370) and the NIH Director’s Office of Research Infrastructure Programs (Primate centers: P51OD11132).